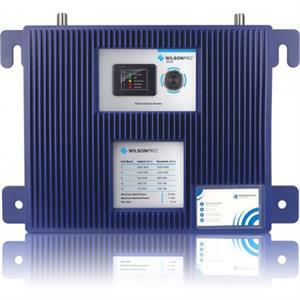 The WilsonPro 1000 amplifies weak cellular signals to provide reliable voice and data coverage–including 4G – to inside spaces where signals may not penetrate and With new eXtended Dynamic Range (XDR) technology, the amplifier never shuts off due to a strong outside signal or changes in outside signals. The WilsonPro Pro1000 amplifies weak cellular signals to provide reliable voice and data coverage–including 4G – to inside spaces where signals may not penetrate and With new eXtended Dynamic Range (XDR) technology, the amplifier never shuts off due to a strong outside signal or changes in outside signals. Like all WilsonPro cellular amplifiers, the WilsonPro Pro 1000 features cell site protections that auto-detect and prevent any cell tower interference. The 460236 is a wall mounted repeater and the kit includes a directional donor antenna, a dome coverage antenna, a lightning arrestor and two Wilson400 cable assemblies (75' & 100').